Today’s May 9. 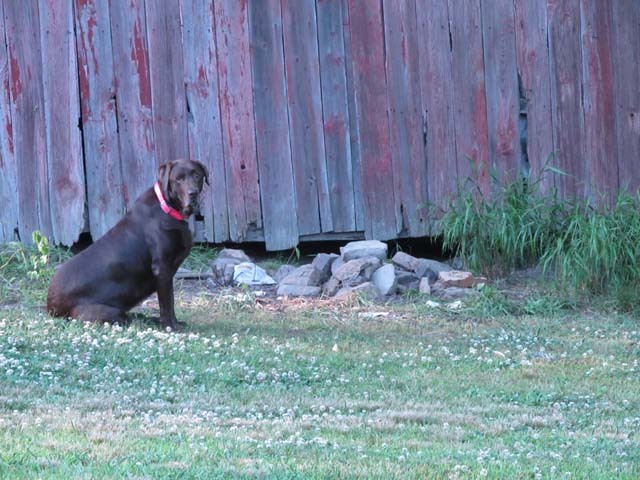 On May 1st Buffy and I went out in the backyard early in the morning. As we approached the gardens, she took off for the barn. 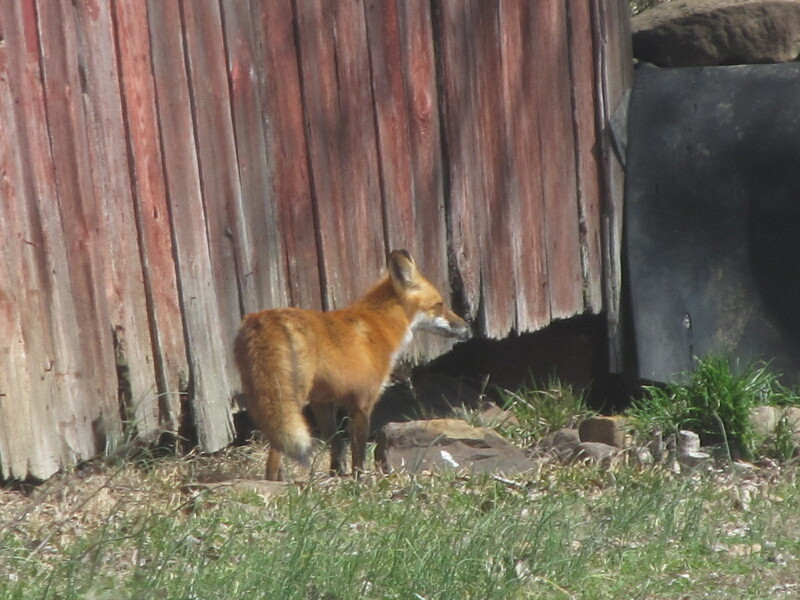 I saw a young fox. Buffy got it around its middle. It yelped. I yelled and Buffy dropped it. This all happened so fast. Thought I caught glimpse of another young one too. 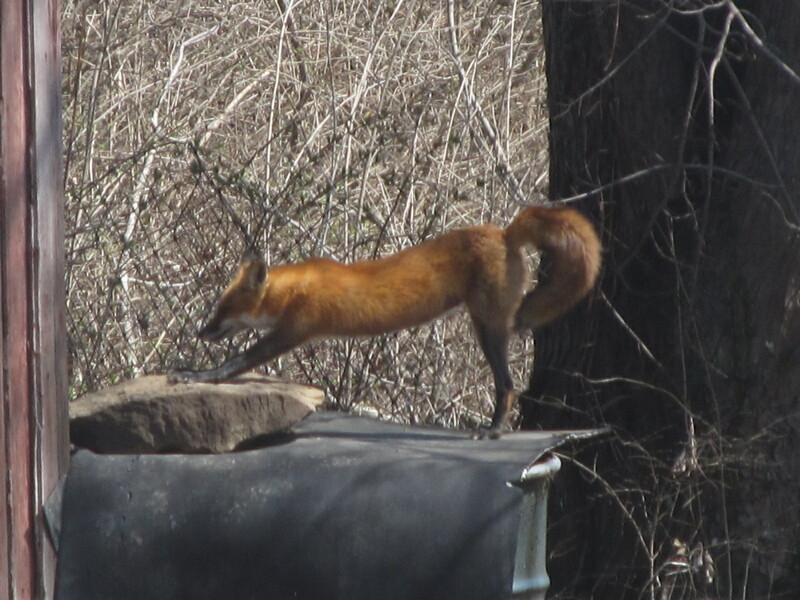 The one I saw, right before Buffy got it, was tannish brown and held its tail straight out the back. I hoped Buffy hadn’t injure it. 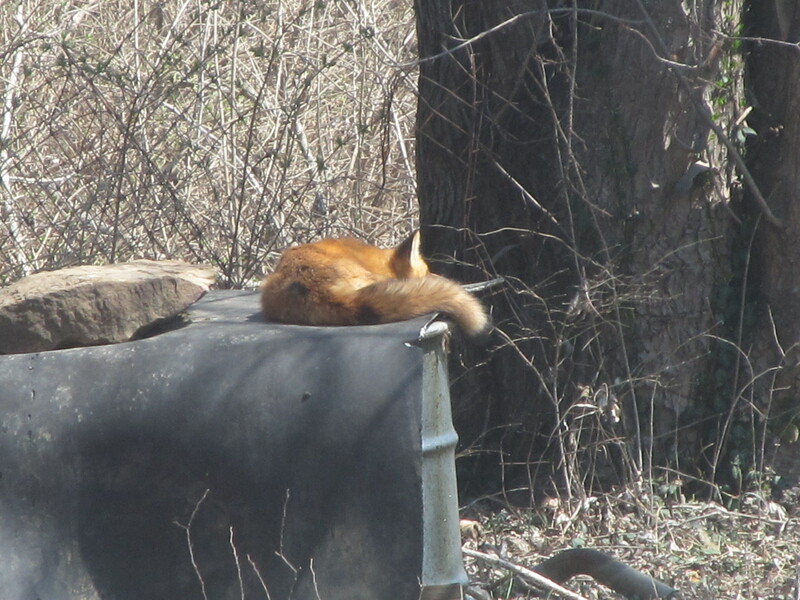 After that encounter I assumed the foxes wouldn’t stay in the yard. 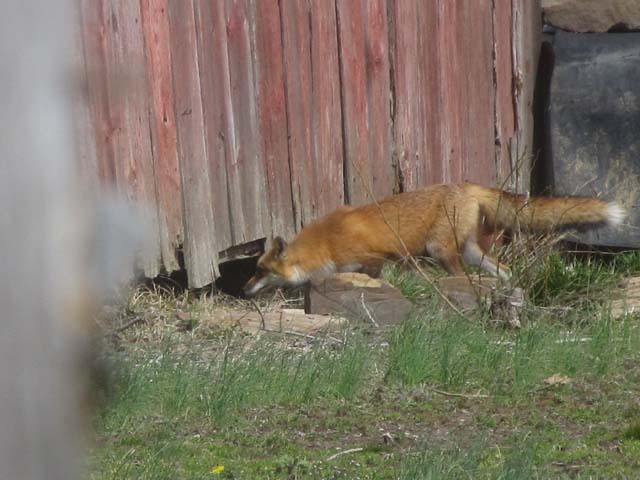 I have seen foxes walk through on rare occasions. They’ve never denned here before that I know of. There wasn’t any sign of activity until the 7th when a faint unpleasant odor came from under the barn, and I found 4 bluejay feathers. 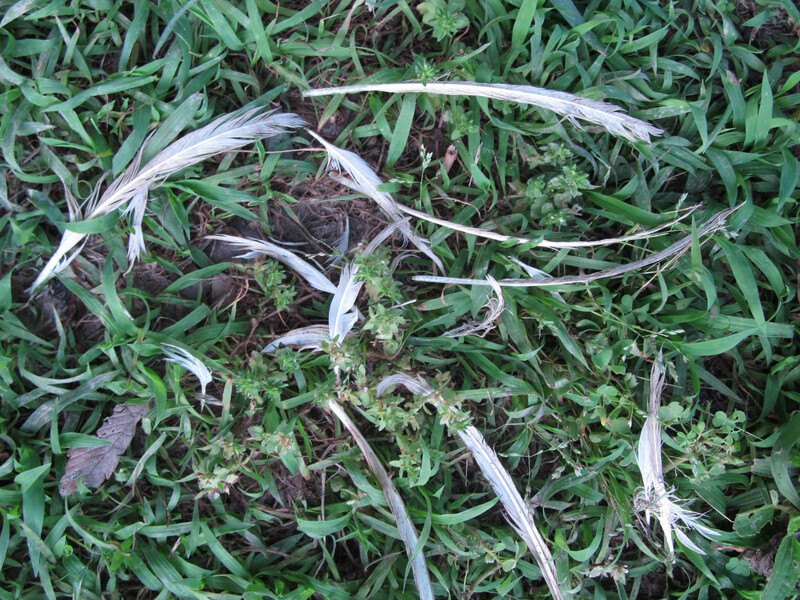 Then last night, while working in the yard, I noticed feathers scattered around out from the opening. All were white, most were small and a few might have been from a wing. The odor was much stronger. 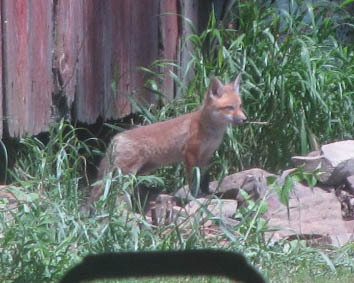 Two young red foxes came out to survey the area. 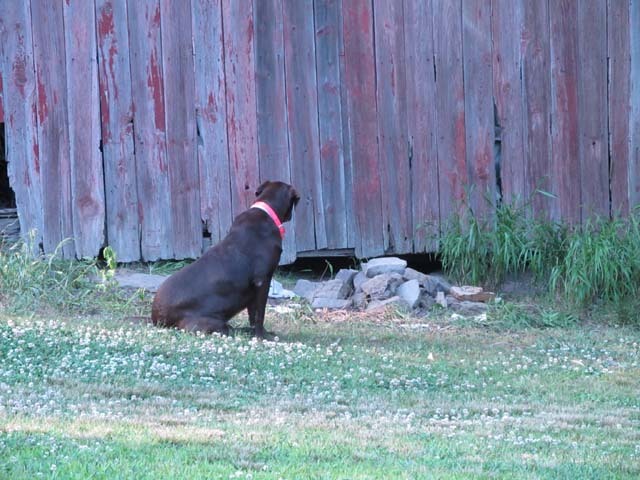 They didn’t wander any farther for some reason. 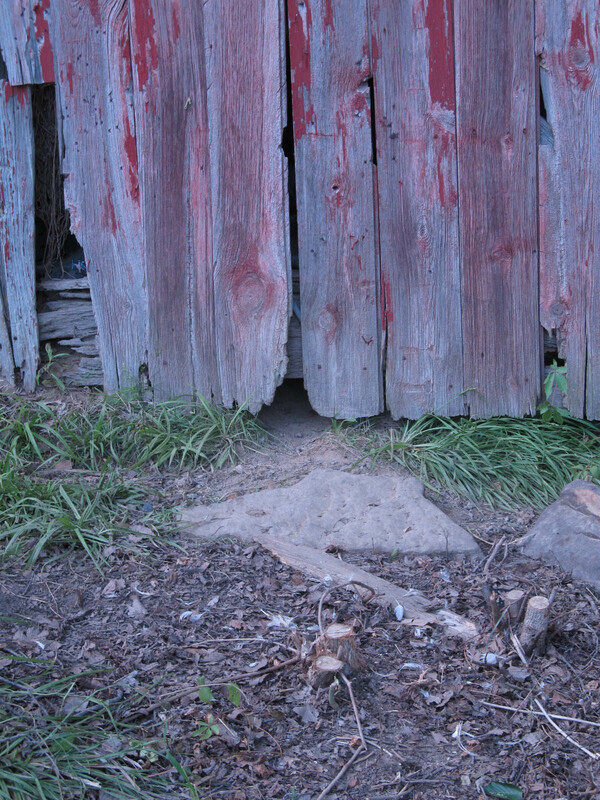 Since dens are used mainly while raising young, I have no idea how much longer they will remain here. 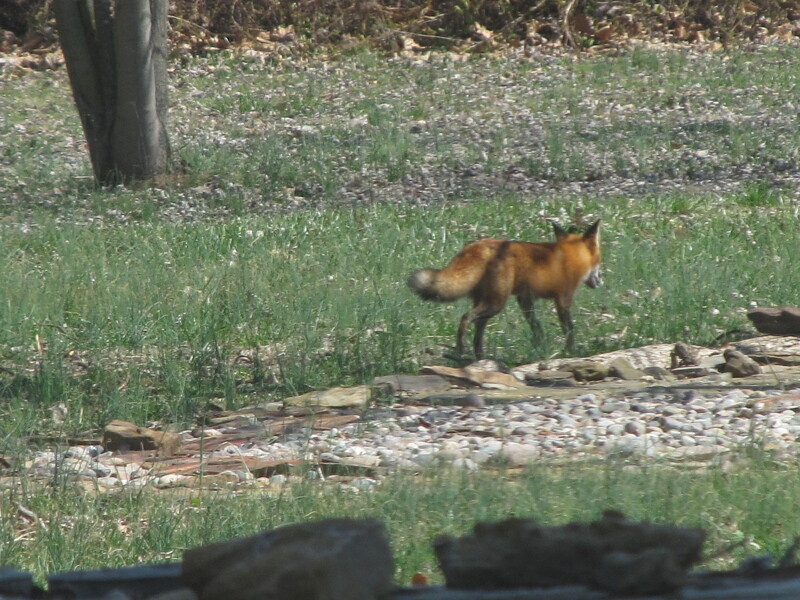 An adult fox’s body only measures 22-25 inches long. 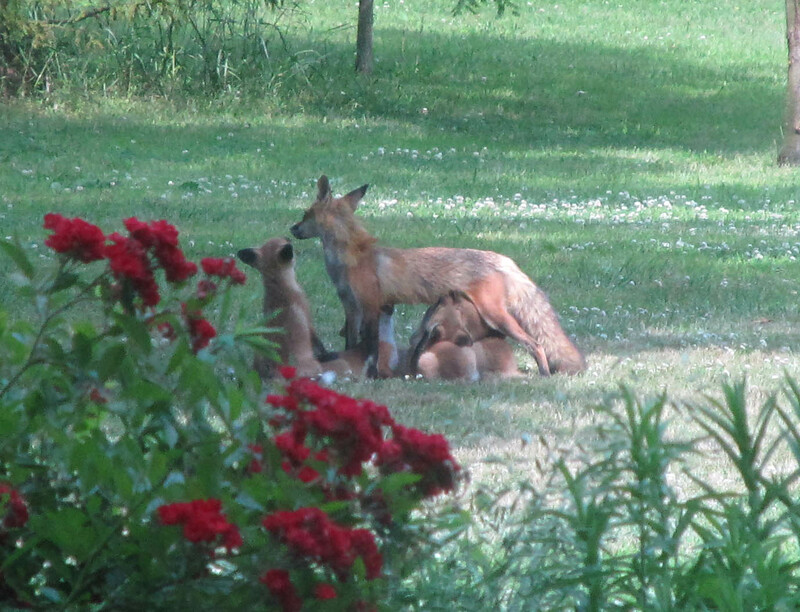 In Illinois Red foxes breed late January and in February, with the young born 51-52 days later. 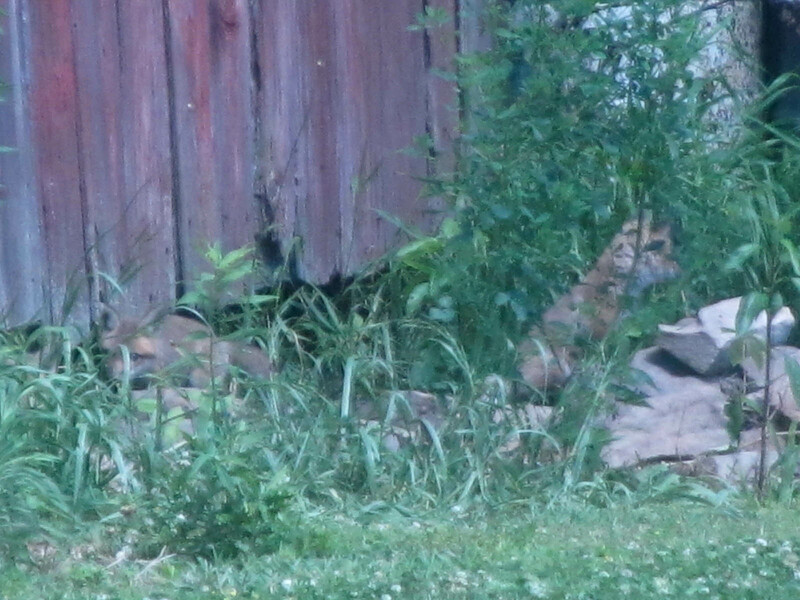 They usually have 1 or 2 other dens in case they have to move their young. 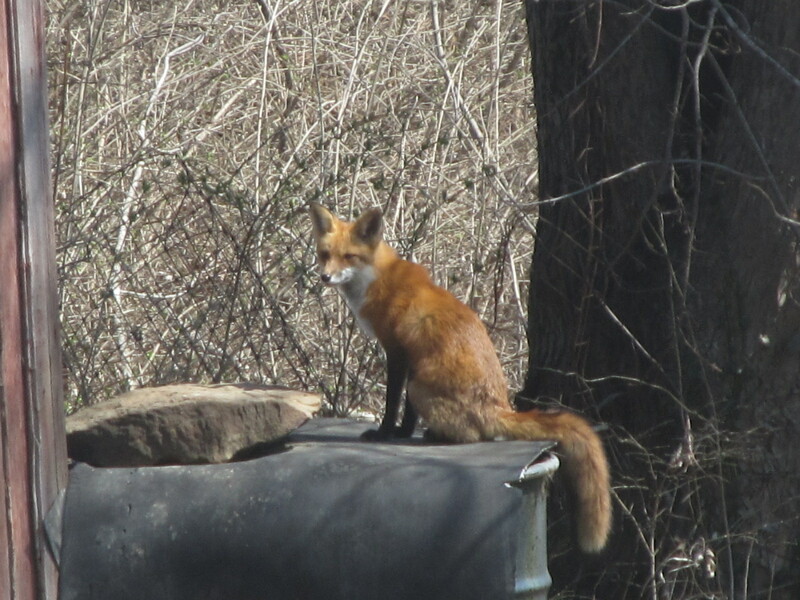 Their habitat includes open grasslands, ditch banks, unmowed field edges, and brushy areas adjacent to wooded areas. Besides birds (mostly chickens) they also eat small mammals, insects, carrion and fruit. 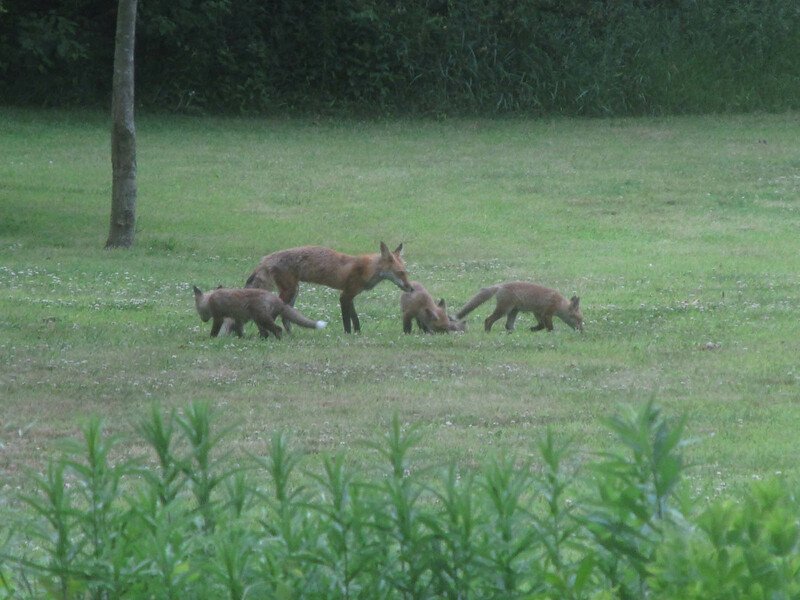 The young will stay with their parents until fall. Now all I have to do is figure out a way I can do my housework from here at the picture window. Well, I didn’t get this posted yesterday as planned. 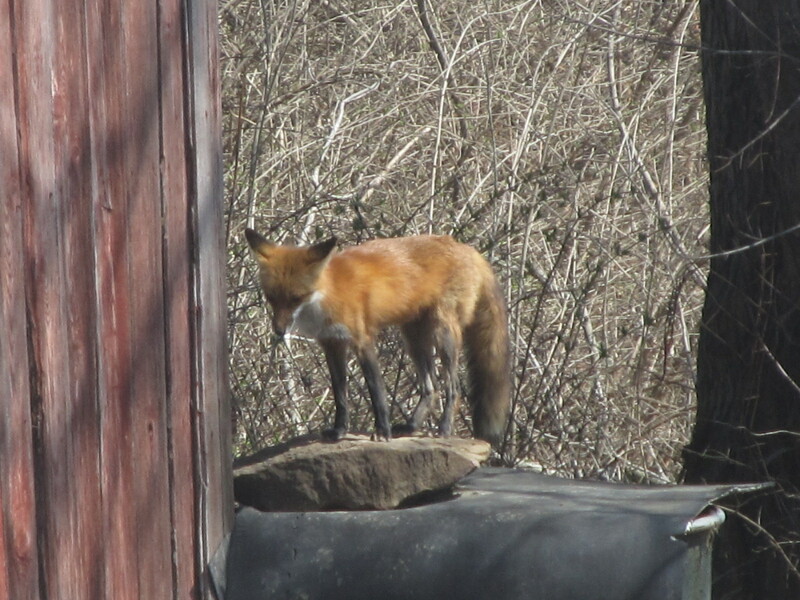 I walked in this afternoon to check for foxes, and one was out of the barn! 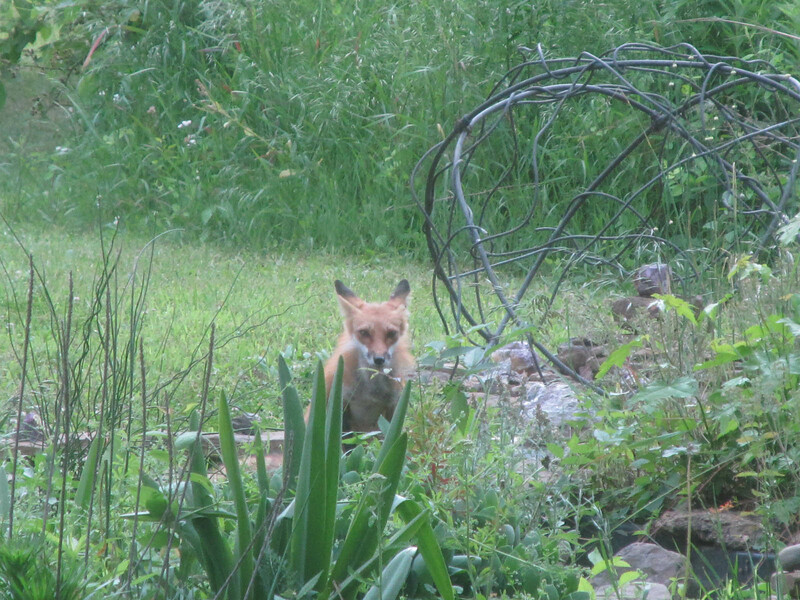 It only stayed out long enought for one picture… and, darn, I left my garden cart where it was between me and the fox. The picture has better quality because I didn’t zoom in as much and then cropped the picture. Not to mention that yesterday I was practically hyperventilating. Now I’m going to wear a path from the kitchen to the picture window!